California Attorney General Xavier Becerra, Air Resources Board Chairwoman Mary Nichols and California EPA Secretary Matthew Rodriquez confronted federal officials at a contentious public hearing in downtown Fresno on Monday. 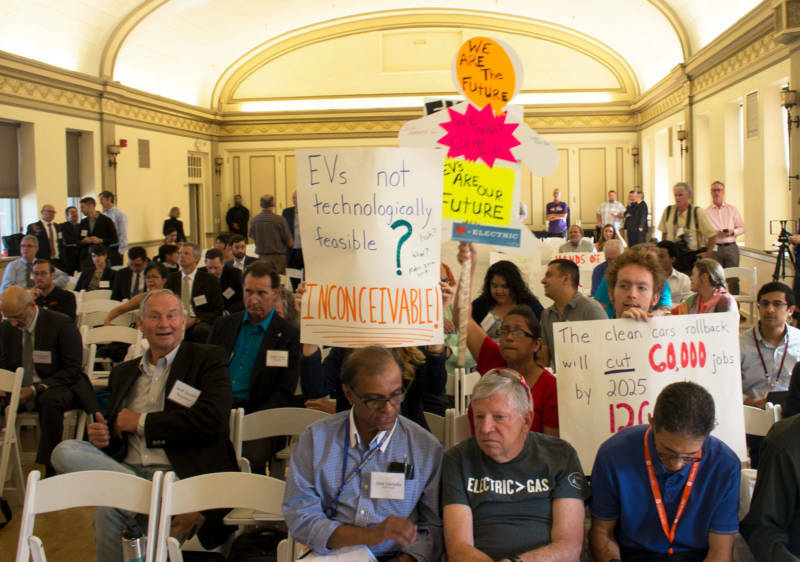 At the hearing, representatives of the federal EPA and National Highway Traffic Safety Administration (NHTSA) sat at a panel on one side of a stage, while dozens of officials, electric car proponents, public health experts and members of the public filed in and out throughout the day to testify. Most expressed opposition to the Trump administration’s proposed changes to federal fuel economy standards. The hearing was part of a 60-day public comment period on the proposed changes. The Safer Affordable Fuel-Efficient (SAFE) Vehicles Rule for Model Years 2021-2026 Passenger Cars and Light Trucks — proposed by the EPA and the National Highway Traffic Safety Administration — would freeze fuel efficiency standards for cars, trucks and SUVs at the 2020 level through 2026. Earlier this year, former EPA Administrator Scott Pruitt called fuel efficiency rules established by the Obama administration "too high." Federal officials argue the new standards would save consumers money and reduce highway fatalities. Critics say the rule would undermine California’s efforts to decrease tailpipe emissions. The Trump administration's SAFE proposal would also revoke California’s waiver of the Clean Air Act, a long-held special authority that lets the state enact stricter air pollution standards for motor vehicles than those set by the federal government. At least 12 other states and the District of Columbia follow California’s lead. California officials called on the Trump administration to withdraw the SAFE proposal — and state EPA Secretary Matthew Rodriquez called the administration's challenge to California's Clean Air Act waiver "illegal." “The challenge to California’s authority to develop vehicle emissions standards is illegal, and disregards a successful decades-long federal-state partnership," he said. After delivering their testimony, the California delegation, including Becerra, Nichols and Rodriquez, made statements and took questions from media. “What is being proposed by the federal government is a non-starter for us. We’re moving forward, whether it’s in court, where we can win, or in the court of public opinion. We’re moving forward,” Attorney General Xavier Becerra said, vowing to take further legal action. California and 16 other states have already filed a lawsuit against the Trump administration's move. 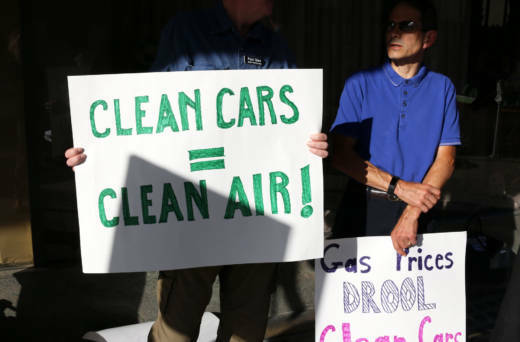 “What the administration is proposing goes way beyond anything that the auto industry has asked for, and really amounts to a form of ideological opposition to anything that might benefit the fight against climate change,” said Air Resources Board Chairwoman Mary Nichols. “We will not sit idly by as you propose to flatline our efforts. We must continue to insist on cars that produce fewer emissions, including millions more zero emissions vehicles," she said. Bakersfield, Los Angeles, Visalia and Fresno top the American Lung Association’s list of the most polluted cities in the country. “There’s some days I can’t ride my bicycle because the air pollution is so bad,” said Paul Gipe, who drove up from Bakersfield with his wife in the couple’s electric car. Additional public comment hearings on the SAFE Vehicles Rule will take place in Pittsburg and Dearborn, Michigan, this week. The public comment period ends in late October.